Got Samsung Galaxy S Duos and get rid of those crappy lags? You're at right place! but, for making it faster, you first need to root your Samsung Galaxy S Duos and then apply some tweaks or some cool ROMs. The device is having great, good okay okay type specifications but if I had this 10 thousands, I would have surely bought any other device. I tried Samsung Galaxy S Duos of my friend and found that the RAM was good but the processor was WORST like anything! It was just 1 GHz Dual Core. You can't even expect good gaming on this device, but the RAM is good! Anyway, I won't like to disappoint the customers and the people here who want to root their device. Adrenaline Engine (for overall performance), etc. But you need to root your device in any case to try these applications. And I gotta tell you something! Rooting is not at all very easy process and one can root his/her device in just some seconds. Let's first see the specifications of Galaxy S Duos. Samsung Galaxy S Duos is a decent device with some good and some bad specifications. The device is having 4 inch screen (480 x 800 pixels with 233 ppi pixel density). The screen size is not at all impressive, 4 inch is now-a-days not considered a big screen and you can't even enjoy your cool games and videos in Duos. It is having 4 GB Internal memory (and yeah! 4 GB is user available but only 1.82 GB user available). For boosting the games and running heavy applications, the device has got 768 MB RAM, and that's one of the thing which is good in the device. You get 1 GHz Cortex-A5 with Qualcomm MSM7227A Snapdragon chipset. Only because of it is Snapdragon, the perofrmance of the device is not WORST, if it didn't had Snapdragon, then it would be just a waste at this price amount. The device is powered with Adreno 200 GPU which might never help you to run the games without lag. The device is running on Android 4.0 Ice Cream Sandwich which can be further upgraded up to Android 4.3 Jelly Bean after rooting it! For picturing, you get a 5 Mega Pixels camera which can be also used to record videos at 30 FPS (Frame Per Seconds). Now let's quickly recap the specifications in a list. Don't blame the author or blog- You cannot blame this blog or the author (me, Rohan) for bricking your device! If you stuck at bootloop, not booting or any other problem and will finger out me, then I would actually laugh at you. Support will be provided to the bricked devices- Bricked the device? We know how it feels! Don't worry, I'm here to help you always. You lose warranty after rooting- If you will bring the device to service center for any software upgradation/hardware issue/software issue then you will be dropped out from the service center because you'll be rooted. Always unroot and clear the flashes counter before going to service center after root. 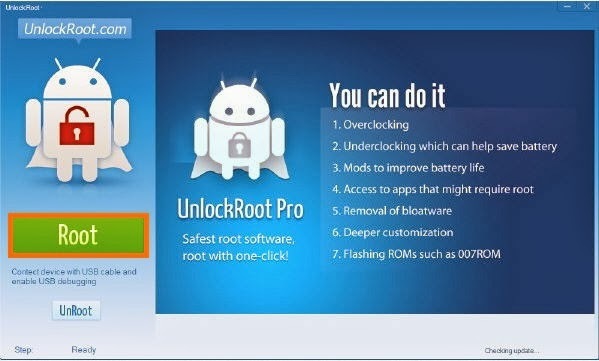 UnlockRoot (Pro or free): Click HERE to go to the official Unlockroot page. Install the USB Drivers (download it from the link given above) into your computer and reboot your PC. Download unlockroot (free or pro, both will work, but I would suggest free version because you don't need it again) and install it into your computer by following on-screen instructions. Attach your device [S Duos] to the computer and don't mount the SD Card, just leave it alone now. Open Unlockroot from the desktop. You'll get a popup do you want to add a battery saver app on your phone. Click yes/no. Click on that big green Root button. You'll get a popup with rooted successfully & reboot your device text. Click on Yes and your device will reboot automatically! If you found an application called Supersu in your Application drawer, then it means you are rooted. Also, you can check with some applications like Root Checker to check if you're rooted or not.